The latest convention of parliamentary majority party United Russia ended in staff rotation in its ruling bodies and the introduction of the first ever primaries procedure with which the politicians plan to beat leftists in the 2016 State Duma elections. During the convention in Moscow over the past weekend, United Russia leader Dmitry Medvedev ordered urgent development of the program to be used at the forthcoming parliamentary elections, due in September. Members of the convention voted to set up a special commission for this purpose headed by Medvedev himself. Major principles of the future program, outlined by United Russia leader at the congress demonstrate a shift from social-oriented policies successfully used by the party to gain popularity during the recent economic boom to pro-business steps and measures that would help to maintain social peace in times of the economic crisis. For this, United Russia launched a separate initiative group, or platform, within its ranks that would concentrate on support to various entrepreneurial initiatives. Medvedev told the congress participants that he considered it appropriate for United Russia MPs to voluntarily refuse salary compensations they are entitled to because of the polls’ rescheduling for an earlier period. When the Russian parliament voted to move the date of the polls from December to September it also agreed that the state must compensate the lost three months of salaries of State Duma members who either refuse to run or lose their seats. Medvedev noted that despite the fact that the State Duma voted against cancelation of this compensation, the voluntary refusal to receive it by United Russia members would greatly boost the party’s image. At the same time, the head of the party commission for work with citizens’ addresses, Galina Karelova, promised to conduct a research into the results of implementation of previous social projects and include those of them that had not yet been implemented into United Russia’s new elections program. Speaking before the congress, Medvedev strongly denounced any attempts to use the revision of current property rights in the elections rhetoric, saying that such extreme ideas could lead the nation to catastrophic times, similar to those that followed the 1917 Bolshevik Revolution. The congress also introduced one major novelty for the party – the primaries or “preliminary party voting” that would take place on May 22. The United Russia chairman told his colleagues that the rotation of party leadership was very important and assured them that only the candidates who would secure strong popular support would represent the party in the September elections. The changes came into effect right away – the voting held during the convention resulted in replacement of about a third of people in its top bodies – the Supreme Council and the General Council. The people who had to leave the ruling bodies included federal ministers, such as Education Minister Dmitry Livanov and Finance Minister Anton Siluanov and Deputy Prime Minister Aleksandr Khloponin. This step had been anticipated by analysts, who said the party was about to get rid of figures connected with the social sphere as in crisis times they are too likely to become easy targets for critics. 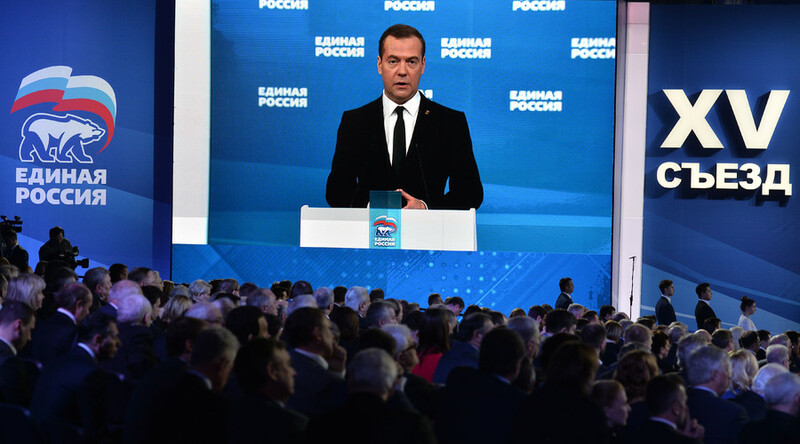 Medvedev also told the convention participants that it faced competition from all sides of political spectrum – the leftists who attacked any pro-business initiatives and the rightists who were ready to completely cancel all social spending and projects. However, the prime minister named the Communist Party o the Russian Federation (KPRF) as the main competitor at the forthcoming polls, due to the difficult situation in the economy and populist rhetoric that the leftists had already perfected. The countermeasures suggested in Medvedev’s speech included counter-attacks on the Communist Party, detailing its own problems and laying out an “alternative agenda” that would counter leftist ideas.